When an electric current – either AC or DC – flows in a conductor, that flow of current (electrons) results in the formation of a magnetic field around the conductor. The strength of the magnetic field is proportional to the amount of electricity flowing in the conductor. That magnetic field is what makes motors turn. The magnetic field in the conductor can be detected by placing what amounts to a transformer around the conductor. The transformer is in the form of an iron core “donut” with a sensing winding that feeds a voltmeter. This device is known as a “current transformer.” The current transformer is the same device that underlies the operation of Ground Fault Circuit Interrupters (GFCI), Equipment Leakage Circuit Interrupters (ELCI), “donuts” in shore power pedestals that measure electrical usage on attached boats, and many, many other forms of electric volt and ammeters. I have a Sears Model 82369 hand-held clamp-on meter. I like that particular meter because it has the capability to measure both AC and DC amps. The typical big box/hardware store clamp-on meter versions are intended for residential use, and usually do not have the capability to measure DC amps. The Sears unit costs about $70, and competes with professional meters costing 3 – 5 times that amount. Even if you never used it to track down AC leakage currents, I find it extremely useful as a DC circuit diagnostic tool aboard the boat. The ordinary use of clamp-on meters in both AC and DC systems is to clamp around a single conductor to measure the magnetic field around the conductor, and thus the current flowing in that one conductor. But when clamped around all of the conductors in any one triplex or multiplex AC cable (Romex utility outlet feed, extension cord, shore power cord, etc), the magnetic field generated by the current returning to the source (white wire) cancels out the magnetic field of the current flowing out to the load (black wire). Thus, with everything working normally/correctly, there will be no magnetic field, and the meter will read “zero” amps. Any non-zero meter reading indicates an unbalanced magnetic field, and therefore, the possibility of some amount of “leakage” current. A “leakage” current is a current going to the load in the hot wire that is not coming back from the load to it’s source via the path that it should take. That is, it leaked out of it’s intended circuit to find another available path to return to its source. On a boat, one possible cause of any current reading measured in an AC shore power cord is that AC current could be flowing into the water instead of returning to it’s source ashore via the intended circuit path. A summer, 2012, ABYC awareness webinar, hosted by Mr. Kevin Ritz, quoted a marine service technician as saying that, in his experience, as many as 10% of boats in a marina would have problems resulting in AC power leaking into the water. To test and verify that statement, I took my Sears clamp-on ammeter and surveyed the docks at my home yacht club. After I zero’d my meter, I found most boats measured at less than about 0.06 – 0.08 amps, so 60 – 80 milliamps. I can’t comment on the accuracy of my inexpensive Sears meter at those low current levels, but since I saw a large sample size of different boats that fit into that range or lower, I concluded it’s probably OK. I will continue to investigate that assumption. Of about 80+ boats on our docks, I found four that had leakage currents of 0.25 amps AC or more. I found one with a leakage current of 2.5 amps, and the owner of that boat also told me his diver had reported that he’d “gotten a tingle” while cleaning the bottom and changing zincs. The diver was not hurt, thank heavens! Our yacht club is located in a basin of brackish water on the Chesapeake Bay. But in fresh water, that could easily have been a lethal situation. This particular boat is a 1970s vintage that has had a lot of modernizing work done to it over time. As would be expected, the work was performed by many different technicians. The modernization upgrades included adding a net-new heat pump and a net-new AC shore power inlet circuit to power the heat pump and raw water circulator pump. When clamped-on the boat’s shore power, we saw that when the heat pump cycled “on,” the leakage current was 2.5 amps, but when the heat pump cycled “off,” the leakage current went to “zero.” So, armed with my clamp-on meter, I clamped-on the cable supplying the boat’s raw water circulator pump, but found no leakage current at that point. Then I checked the entire heat pump unit at the power feed to the unit: again, no leakage current at that point. That told me the leakage was occurring at an earlier point in the circuit, and not within the heat pump equipment itself. Next, we checked back at the boat’s inlet disconnect breaker which was located immediately at entry to the boat: at that point in the circuit, we measured 2.5 amps of leakage current. Finally, we checked at the branch circuit disconnect breaker on the heat pump AC distribution panel; i.e., at the breaker that feeds power to the heat pump. And there we saw the fault, which was energizing the boat’s AC safety ground buss. The hot line to the heat pump is served by a 20A circuit breaker, and the neutral and the safety ground are located on physically adjacent, but separate, buss bars on the back of the distribution panel. That is normal. The original crimp of the terminal on the neutral wire was not made-up tight enough, and over time, the neutral wire had vibrated out of the crimp terminal. Normally, that would just cause power to the heat pump to be lost, and the symptom would have been that it didn’t run. But as amazing as these things can be, by coincidence, the loose neutral had come to rest lying on the adjacent safety ground buss bar. Thus, the heat pump and circulator pump ran normally. Until the diver reported “getting a tingle” while working in the water under the boat, no one aboard was aware there was any sort of problem. No circuit breaker blew. There was no noticeable loss of cooling/heating performance. Simply, no symptoms, except that the diver got slightly zapped. This ground fault is one of the three conditions that must all be present concurrently in order to cause power to leak into the water. I repaired the bad crimp. That corrected the fault that had energized the safety ground buss, and stopped the leakage of AC power into the water. However, somewhere on that boat, there was also a high resistance that was compromising the functional integrity of the safety ground connection to shore (causing a high resistance connection). That has now been corrected by replacing the shore power L5-30R female cord end and the L5-30 inlet connector for the shore power service for the heat pump. My inexpensive Sears clamp-on ammeter is not a laboratory precision tool, but it proved to be an effective screening tool that can be used by lay boat owners and maintenance personnel to identify potentially serious situations. The take-away message is, my Sears hand-held clamp-on meter definitely identified, and confirmed, that there was an AC leakage current problem aboard that boat. If this boat had been fit with ELCI (an Equipment Leakage Circuit Interrupter), or if the dock had been fit with a 2011 NEC Article 555 compliant Ground Fault Protection (GFP) disconnect device protecting it, this problem could not have existed past it’s inception, and an obvious potential shock safety problem would have been foreclosed, with appropriate warning to the boat owner and the marina. In the above scenario, it was the heat pump circuit that caused the fault that placed AC power on the boat’s safety ground buss. It is important to realize that any electrical attachment or electrical circuit on the boat could fail in a similar manner. Therefore, to do a truly effective screening of your own vessel, it is necessary to not only start and run the heat pump, but every and all AC appliances and equipment, including battery charger(s), water heater, galley and house utility circuits, refrigerator, ice maker, water maker, washer/dryer, davit lifts, etc., etc. ALL APPLIACES AND ATTACHMENTS! One last note: marine electrical “experts” do not regard the above screening procedure as “fully” diagnostic. They are correct. This screening test is not definitive for root cause. 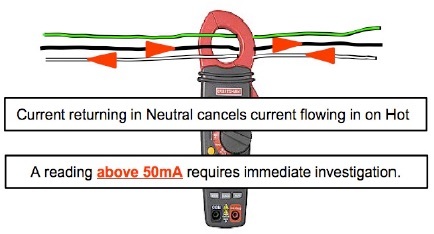 Because the clamp-on meter is placed over all three (or all four in a 240V case) wires in the shore power cord assembly, this test does not isolate fault currents that could be flowing onto the boat from a “hot basin” via the safety ground conductor from those flowing into the water due to a defect aboard the boat. Since it is possible that a faulty circuit could be inactive at the time of testing, it is possible that a fault may be overlooked. And sensitivity and/or precision of inexpensive clamp-on ammeters may be less than that of professional test equipment. Nevertheless, it is effective as a screening test which identifies that there is something wrong that needs further investigation. Measurement of only the black and white current carrying conductors (but without the green safety ground) can be accomplished with the use of a simple, home-made test adapter. This test adapter also allows measurement of the green safety ground conductor by itself. In this way, it can be definitively determined if a piece of equipment on the boat is the cause of a leakage current, or if the boat happens to be lying in an energized basin, or both. Use of such an adapter would necessarily involve unplugging the boat’s shore power cord, which would be undesirable for a number of reasons in the absence of the boat’s owner. While I agree that simply clamping around a shore power cord as a sampling procedure is not definitive, it does have the advantages of low cost and great simplicity for laymen with little or no prior electrical skills. Even with its limitations, the disciplined use of a clamp-on ammeter as a simple screening procedure can identify the escape of AC electricity from a boat into the water. I commend it for use by all boaters at all skill levels. If all you do is observe a suspicious condition that warrants calling in a marine-certified professional electrician, you may have saved a life. That life could well be one of your own children or grandchildren, a dear family friend or a beloved pet. So, although not perfect, and not as good as an ELCI device, pretty darned good, all the same! This entry was posted in Boat AC Topics, Ground Fault Example on 2013/01/12 by gilwellbear.